You don’t get to be a miller just like that. It takes a lot nowadays before they entrust you with your own windmill. Once you just worked alongside the others, kept your eyes open and that was about it. That’s when more than 10,000 windmills were working in Holland. Now only 1000 are left, so we need to care for them. Volunteer millers have been trained by a national institute since 1963. 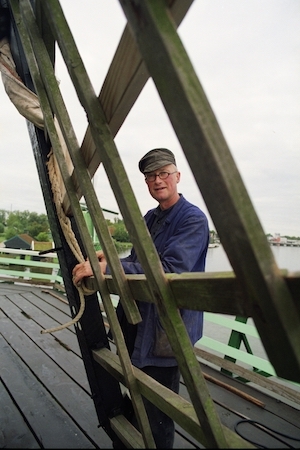 Most of the windmills in Holland are manned by volunteers. Broadly speaking, only about 50 are run as businesses. The training takes 2 years. After graduation the candidate miller must know all types of windmills plus their component parts. Of course he must have a good knowledge of the fickle weather here. It’s a difficult exam, sometimes the pass rate is only 50%. It has to be demanding, though, because you’re working with an expensive piece of national heritage. The forces involved are immense; if you guess the weather wrong you might lose the mill to lightning or gale damage. Books have been written on our rich windmill heritage. I am very happy to say that I’ve been a professional miller for 28 years in 2009. I could fill a book with my own experiences, but that’s for later. My day always starts with my listening to the weather forecast, before I hop on my bicycle and ride to the mill. I always keep an eye out for flags and smoke plumes to discover the wind’s direction. I can make a fair guess at the wind’s force on the bike. Is it strong enough to work the mill, or are we going ‘loose’, without the millstones? The first thing I do when I get there is trim the mill to the wind. You can turn the cap in all directions, but it’s hard work if the wind’s shifted 90 degrees. The cap rides on rollers and it takes a lot of muscle power to turn it – and a lot of grease. The weight involved is 15 tons, all moved by hand. You have to sheet the sails depending on the force of the wind, just like a sailing ship. Then up into the cap to grease the moving parts. I use rotted hog lard, one year old. Then back down again, hoping the coffee’s ready. Our mill receives more than 100,000 visitors every year. This makes Verfmolen de Kat the busiest mill in the whole of Holland. Not surprising, when you consider its beautiful location. Flanked by the river Zaan, the area’s industrial lifeline, and the wide open Kalverpolder on the other side, with all the springtime birds. We use two pairs of millstones. Barrows full of champagne chalk in lumps are ground with millstones weighing several tons. Many a soccer pitch has white lines of chalk milled at De Kat and many a hand-made pastel colour comes from our mill. Then we have pigments, terracotta colours from France and Italy. Umber, Sienna, Ochre: beautiful products, all ground fine in our closed mill chamber. 80 kilos an hour. The product is sieved before being turned into lovely products: oil paint, pastels, or even to decorate the living room. When the mill’s running it shakes and quivers, the thunder of the millstones fills the whole structure. It sometimes scares the visitors but I enjoy this primeval force. Around 17:00 I go aloft to put on the brake. It’s closing time. The canvas is furled, the lightning conductor is attached and the sails are made fast with strong ropes. All is calm and peaceful in the mill below, with the setting sun shining in. The mill is closed up and I get back on the bike. Must look at the weather forecast this evening. The miller’s day draws to a close.